IPIC - ''Heart in Heart'', Personalized Artwork with Names and Date on, Perfect love gift for Anniversary,Wedding,Birthday and Holidays. 7#P (18x12'') by IPIC at Eny Theme. MPN: FD0032C751812. Hurry! Limited time offer. Offer valid only while supplies last. IPIC Brand Quality: production from one of the world's leading wall decor manufacturersReal handcrafted canvas prints produced and hand-made in USA. 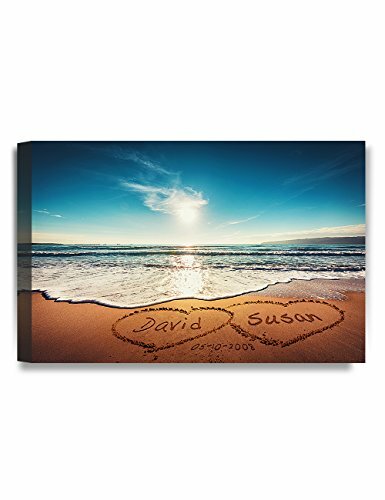 Personalize it with the couple's names and special date,or your own ideas.Please be noticed that personalized artworks are not refundable, so please double check your information when customizing. 100% Cotton Canavs Print, Stretched and wrapped on real woodern frame bar,ready for hanging. Size: 7#P(18x12"), Strengthened Depth: 1.5". Semi-Gloss Acrylic Coating applied to enhance appearance, and to protect the print from dirt and dust, thereby extending the lifetime of the print and keeps it from fading. IPIC a registered Trademark, Brand Quality, production from one of the world's leading wall decor manufacturers. Made in the USA. If you have any questions about this product by IPIC, contact us by completing and submitting the form below. If you are looking for a specif part number, please include it with your message.